Crude Accountability, in collaboration with Busboys and Poets, hosted the US launch of “Parting Song,” a book of poems written in prison by the former Minister of Foreign Affairs of Turkmenistan and former Representative of Turkmenistan to the OSCE, Batyr Berdyev (video). The hard copy of the book with the poems in the Russian original and in English translation, produced by the “Prove They Are Alive!” campaign, was presented for the first time in the United States on March 7th, 2018, during a special event at Busboys and Poets – a vibrant Washington DC venue that combines a bookstore, a restaurant, and an art space, and often hosts artists promoting social justice and equality. 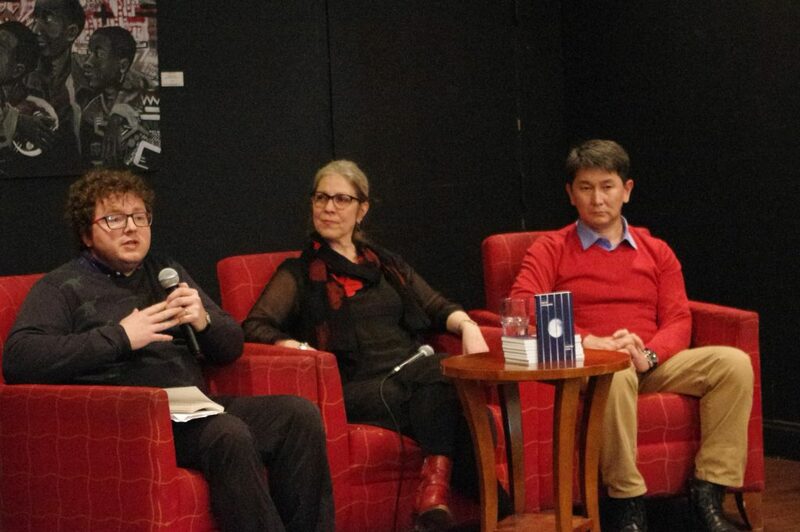 The launch event included a panel with James Womack, poet, literary translator, and publisher from the U.K. who finalized the English translation of the poems, and Lukpan Akhmediarov, award-winning journalist and activist from Central Asia. The panel focused on the recent human rights developments in Central Asia, updates on the disappeared, and, most of all, a discussion about art and poetry and how they can bring more visibility to international advocacy. After the discussion, Alex Johnson, poet and Open Society Foundation Senior Policy Advisor, and Fatima Djalo, performer and TV-presenter, recited the poems both in Russian and in English. Their emotional and artful presentation beautifully represented the poetry in both languages. Earlier that day, the Open Society Foundation hosted Crude Accountability and guests for a discussion of the current political situation in Turkmenistan, the issue of the disappeared, and ways of finding innovative practices in international advocacy. “Art in advocacy leads to more visibility in this particular case of Batyr Berdyev, and in general,” says Alex Johnson, Open Society Foundation. You can watch the full recording of the panel discussion on our Youtube channel. Batyr Berdyev was arrested in 2002 and charged with involvement in an alleged coup attempt against then-President of Turkmenistan Niyazov. He was convicted and sentenced to 25 years imprisonment. Testimony was given that Berdyev was beaten and tortured by the authorities during the investigation. His relatives have had no information about his fate or whereabouts since after his trial. Berdyev is a victim of enforced disappearances and has not been seen since December 2002. Judging by the dates on some of the manuscripts, the poems were written in prison between December 2002 and March 2003. The manuscripts were smuggled out of prison and passed on to an acquaintance abroad and eventually to the Prove! campaign, which translated them into English. Parting Song was published and presented in Europe in September 2017 at a side event at the OSCE Human Dimension Implementation Meeting in Warsaw, Poland. Batyr Berdyev is one of 113 cases of enforced disappearances documented by the international human rights campaign, Prove They Are Alive!. Each of the 113 cases is a human tragedy. With this book, the campaign hopes to give this number a human face. Until their relatives hear about the fates of their loved ones from the government of Turkmenistan, the campaign will continue to demand that they Prove They Are Alive! The book is available for download for free on the campaign website. The international human rights campaign Prove They Are Alive! has been working since 2013 to protect the rights of detainees serving long-term sentences in Turkmen prisons who, since their sentences, have been held incommunicado. The campaign actively interacts with a broad range of human rights defenders, experts, and inter-governmental organizations, including the United Nations, the Organization for Security and Cooperation in Europe, and the European Union. Crude Accountability is an environmental and human rights nonprofit organization that works with communities in the Caspian and Black Sea regions who battle threats to local natural resources and negative impacts to their health. Crude Accountability is a founding member of the “Prove They Are Alive!” campaign and is a co-sponsor of the day’s events.